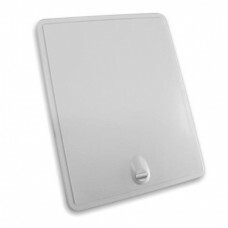 Access door panel can be used to hide/lock away gas and water taps to prevent easy access or accidental turning on/ off. To fix the panel a hole size is required - 154mm x 204mm, (12mm lip). The frame fixes to the wall with 4 screw holes then the door can then slot into the frame and is secured closed using the pinch lock.